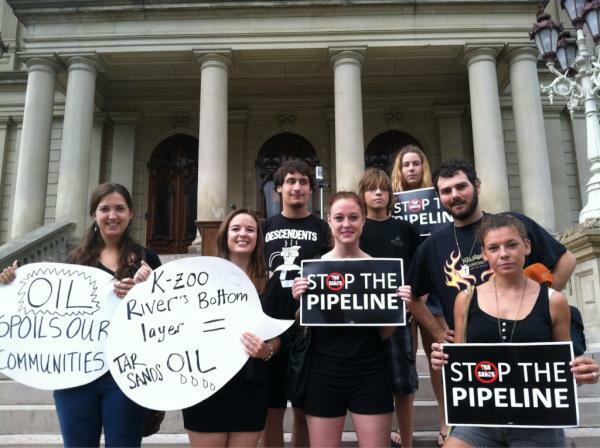 Groups including The National Wildlife Federation, We Are the Kalamazoo, and Michigan Student Sustainability Coalition, met with state representatives to protest the planned expansion of the very same pipeline to pump more than three times the oil through it – 8oo,ooo barrels a day. July 2010, more than a million gallons of tar sands crude spilled into Michigan’s Kalamazoo River. This is the largest inland spill in US History. A fired cleanup worker with a dark past claims he was ordered to cover up oil to meet federal deadlines. His case went to trial last week. 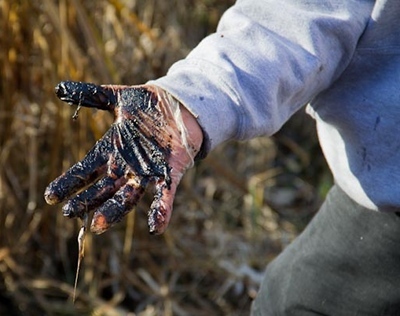 Even today two years later, one can still scoop up handfuls of Tar Sands Oil from the marshlands surrounding the river. The communities living around the river are still sick with nerve damage and other illnesses related to the chemicals diluting the Tar Sand Oil. Enbridge still claims the river is clean. On Earth covers the story of the Enbridge spill, and its attempted cover up in a four part series. Click here for the full series.